At Apple’s music event they introduced Ping – a social network for music that lets you follow users/artists and comment on their activities. The other important announcement Apple made was about Game Center going live soon. Over the past few days it has been interesting to follow the event’s coverage because you know who has both these services ready and live for their mobile platform? Not Android, take another wild guess, not Palm either… It’s Microsoft. Zune Social lets you create your own circle of friends and share your music preferences with the web at large, and it has been around for quite a while. Then there’s Xbox LIVE. Neither offerings from Microsoft have been considered as reason for iTunes Ping or Game Center. The wide-spread existing Xbox LIVE community and the Zune Social user base Microsoft has is significant to their mobile strategy, Apple decided to do something about it. GigaOm calls Ping the future of social commerce, well with all due respect, this future has been around for quite some time. In Apple’s favor, the collective wisdom of the Internet seems to have avoided mentioning Windows Phone 7 as the catalyst for Apple’s new services. 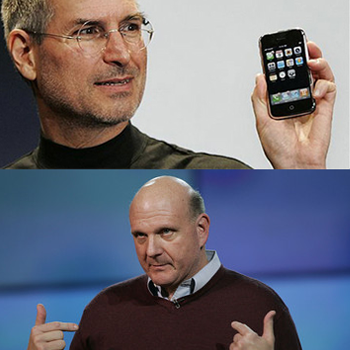 I say Windows Phone 7 was the primary reason why Apple launched them. While Jason Calacanis might be right in saying Jobs created Twitter and Facebook in his spare time, the motivation wasn’t to “eat Zuck for breakfast”. It was to ensure that Apple had a reply to Windows Phone 7’s strengths. Jobs might not openly accept it but introduction of iTunes Ping and Game Center clearly imply that Apple considers Windows Phone 7 as competition. Microsoft, you’re back in the game.